As I wrote on Friday, Douglas M. Chapman filed to run for two offices at the same time, seeking re-election to the East Orange County Water District while simultaneously challenging Orange County Water District Director Denis Bilodeau‘s re-election bid. Had Chapman simply sought re-election to the East Orange County Water District, he would likely have had a nice, quiet re-election campaign. However, Chapman inexplicably decided to challenge incumbent Denis Bilodeau for the Orange County Water District while still running for re-election for the East Orange County Water District. Now, Chapman faces a two-front war, with two very formidable, popular opponents. 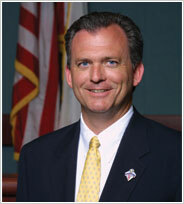 In the Orange County Water District, Division 2 seat that Chapman is seeking, not only is Bilodeau the incumbent, but he is also the Mayor Pro Tem of Orange – the largest city in the division. In the East Orange County Water District where Chapman is seeking re-election, the district consists of Tustin, slivers of Orange, and nearby unincorporated areas, but his challenger is former Tustin Mayor Doug Davert – and Tustin is the bulk of the district. Both Bilodeau and Davert can raise substantial sums of money that Chapman will be unable to match. To make matters worst for Chapman, their names are the rather similar “Douglas M. Chapman” and “Douglass S. Davert” on the ballot for EOCWD. Not only that, but the Assembly Member who covers both seats is Don Wagner, whom Chapman ran against unsuccessfully for the South Orange County Community College District in 1998. Challenging an incumbent like Bilodeau is no small task, and now Chapman faces a tough re-election bid – simultaneously. Not only could Chapman lose his bid to unseat Bilodeau, but now he risks his own seat to Davert. Chapman’s effort to win two water board seats in the same election could cause him to go from having one water board seat to none.